I’d never done an article on this Cham sanctuary before, which is nevertheless one of the essential places to visit in central Vietnam. Located 50km from Hoi An, MySon is an ancient Cham temple built between the 4th and 12th centuries by the Champas and designated as a Unesco World Heritage site in 1999 (like the old town of Hoi An). It was discovered by the archaeologist Henri Parmentier in 1898. To be honest, the sanctuary is rather small but if you are fond of Vietenamese history, then it’s an interesting and enjoyable tour. In addition to this, don’t forget to visit the Cham Museum in Da nang where many Cham statues are on display. If you have already visited the temple of Angkor, you may be disappointed but it would be a shame to miss out on this sanctuary. There are Cham dance performances every morning at 9:30 am, 10:30 am and 2:30 pm. 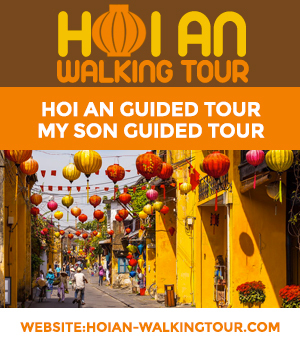 It takes between 1 hour and 1 hour 20 minutes to get there from Hoi An. When visiting MySon, I strongly recommend hiring a guide (100,000 VND – available on site). Otherwise, you will miss out on a lot of interesting things, including the temple’s history. It’s best to go around 11 am or 12 pm as there are fewer tourists. Otherwise, it can be quite crowded. This is not necessarily always nice. Don’t forget to visit the Bang An Cham Tower on the way to MySon (it is located in Vinh Dien). – By scooter (100,000 VND for rental + 5,000 VND for parking). – By bus, it costs 70,000 VND. The cheapest but also the longest way as the bus makes frequent stops. Or you can go with Sinh Tourist who organises a trip there every morning. – By private car, it will cost you around 600,000 VND. The entry fee costs 150,000 VND (100,000 VND for the Vietnamese). There are 2 exhibitions at the entrance of the site: one on the renovation of MySon by an Italian-Vietnamese team; the other on the sanctuary’s history. The two are interesting and you should not miss out on them. MySon is made up of 9 parts (some are poorly indicated and difficult to find, I’d suggest taking a photo of the temple map before beginning your visit), the first of which is the largest and the most interesting of them all. It is also the one that has remained the most intact. What I liked was the exceptional architectural design as well as the different statues of Shiva or Vishnu, for instance, that adorn the different temples. You can still visit 2 or 3 of them but they are relatively small. Inside, there are some artefacts. In the other sections, there is not much to see unfortunately and for the most part, there are only 1 or 2 buildings still standing in the middle of the ruins, which are beautiful but it is not quite enough. Renovations are underway. In the end, I think that if you are not staying for long in Hoi An or if you have already visited Angkor (I met several disappointed tourists because they had already visited the Cambodian temple), you can give it a miss but if you are passionate about history, it is a temple not to be missed out on as well as a visit to the Danang Museum. The two go hand in hand.